There are many different areas that RFID Chips implanted inside you can go. This is definitely an eye opener. As we move closer and closer to a world wide cashless society, I could see how a chip system could be used to get your daily rations and be accounted for one day soon. If you are a free thinker and don't want the chip, does this mean you don't get a job? Can't use public transportation? You don't get to eat? With this in mind, this is a 2015 article including a video of a company that is already using this practice in Sweden. I would never willingly take a chip implant. They will either force me or kill me first. It's time to learn to live off the land and appreciate what nature can offer us, but it will take a massive amount of people to do this to have any major impact. I've been studying survival techniques and storing water a lot lately. There is so much to learn, but I have to start somewhere. Ya know.... just in case SHTF. Defending my resources would be another dilemma. I always say that the Apple watch and things of that sort that let you pay by waving your hand over a payment reader are the next step to actual chip implants. Slowly ease the population into liking the idea of convenience and they will gladly accept the chip. Did you know Apple recommends wearing the Apple watch for a maximum of about 18 hours a day? Freaking ridiculous.... We really don't need to be chipped because our smart phones tell them everything they want to know. People are already using smart watches to run their lives and monitor everything in between. I'm sure the chip will be happily accepted by many because of the convenience, but strongly opposed by folks like us that value health and privacy. Before Aaron Russo died (probably murdered), he revealed the fact that the Rockefellers and the other scum of the earth families would be implementing a cashless society with electronic chips and if you don't comply then they simply shut your chip off. I personally feel like some sort of catastrophic event needs to happen for them to implement this "novus ordo seclorum" (see US 1 dollar bill) into society. Although many people say the NWO started in 1913, I don't think the main goals are completed - yet. It's all happening slowly so most people don't notice or pay close enough attention. The average person is too focused on paying bills and taxes so they don't get their home/land stolen by a bank, or get kidnapped by militarized police for failing to insert phrase here, or what's new with the satanic Kardashians, or their favorite rigged professional sports. Sad, really sad. I always say that the Apple watch and things of that sort that let you pay by waving your hand over a payment reader are the next step to actual chip implants. Slowly ease the population into liking the idea of convenience and they will gladly accept the chip. It's all happening slowly so most people don't notice or pay close enough attention. SHIIIIIIIT!!!!! look what i got today from my bank!!!! We already have those contact-less cards for payments under £20 in the UK. 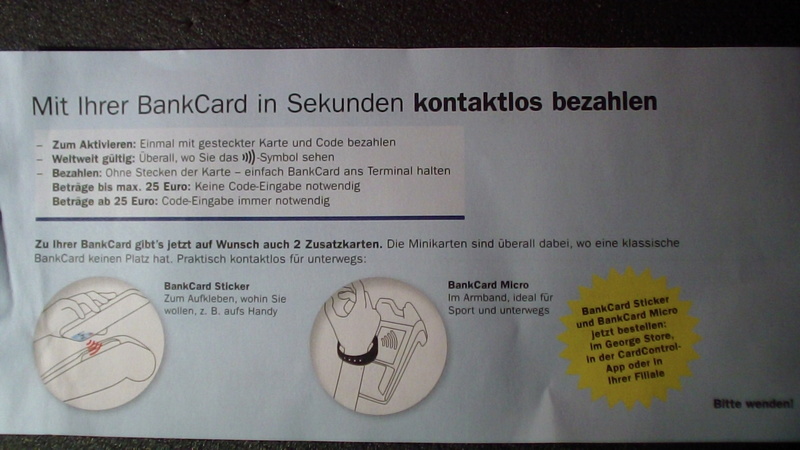 They are the same size as a normal credit/debit card but you do not need to enter a PIN code. All people need to do is modify a card reader, walk around a super market and literally harvest £20 off everyone who owns one of those cards. It is certainly just another step to the microchip and a totally Digital currency, much like Bitcoin. People claim Bitcoin is getting away from the current system, but it is actually just playing in to the Zionist Bankers hands. Bitcoin requires an Internet connection to hash the algorithm all the time so it becomes the perfect Digital currency to have on a micro chip implant. This means there will essentially be a huge wi-fi network covering the Planet, once this is installed they will bring forward the microchip implants and a Digital currency. Then, everyone and every transaction will be traceable at all times. Bitcoins are created by recording bitcoin transactions into the blockchain. Nearly everyone regards Google Glass as a failure, but what they don't understand is that it was just an early arm of phase two of the human transition towards RFID chips. Phase One: Mobile (Cell Phones, Tablets, etc) Get people using tech around the clock in their hands. Phase Two: Wearables (Google Glass, Apple Watch, etc) Get people using tech on their bodies all throughout the day. Phase Three: Implantables (RFID chips) Implant tech inside people for 24/7 control and monitoring. It's that black and white, and it's the path we are headed on a collision course with unless people wake up to the dangers of the transhumanist movement. Periodicals like the NYT aren't helping either, as they paint a nearly completely positive picture of the idea of being chipped, as well as pointing out that it's FDA approved. Of course it's FDA improved, the powers that be want it implemented as quickly as possible. On a related note to the earlier post about the Rockefeller role in all of this, here is the infamous interview of Aaron Russo discussing the conversation he had with Nick Rockefeller regarding the NWO and its microchip agenda. As for bitcoin being the building blocks for a cashless society, here's an indicator of the future, Goldman Sachs has recently been granted a patent on its own cryptocurrency known as SETLcoin. You better believe the banksters aren't going to miss out on the crypto market. Any Mr. Robot fans will take note of the predictive programming when the banks failed and they introduced their own cryptocurrency to "alleviate" the financial crisis, something similar we should unfortunately be preparing for in the US. Welcome to IFERS and a very good first post! when it comes to the point where RFID scanners are everywhere they will be able to track where you are at any time by the last RFID scanner you passed and if you have an implanted chip it will be unavoidable.